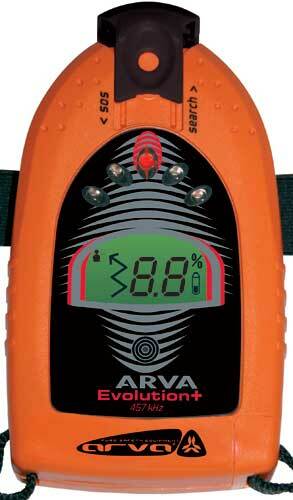 The ARVA Evolution+ was discontinued in 2009. Summary: The now-discontinued Evolution+ is an excellent two-antenna transceiver that, at the time, was similar to the ARVA Advanced, Barryvox 3000, and Tracker DTS transceivers. The controls are a little more intuitive than the Tracker DTS and the range is similar. The Evolution+ was replaced by the ARVA Evo3 in late-2009. Searching: Prior to the 2007/2008 update, the Evolution+ displayed five LEDs similar to the ARVA Advanced and Tracker DTS. Beginning with the 2007/2008 update, the direction indicator is an LCD arrow. The audible feedback of all of the ARVA's is excellent. Multiple Burials: When multiple signals are received by the Evolution+ (or the Evo3), the icon appears on the screen and the transceiver locks onto the closest victim. After locating the first victim, take "one or two steps backwards" in the direction that you approached the first victim, then quickly switch from search, to transmit, and then back to search (by toggling the "nose" switch). This activates a "scan mode." Hold the transceiver very still while it scans for the transmitting beacons. It will then display information about each of the transmitting beacons. The display rotates through this information approximately five times (this is very similar to the "big picture" feature that was introduced many years later in the Tracker3). During each rotation, the screen will display the direction and distance to one of the victims. Head toward one of the victims that you haven't found. If the transceiver returns you to one of the victims you have already located, repeat the Scan mode (by toggling the switch). In my testing of the Evolution+ multiple burial mode, the scan mode did a good job of stating the distance to the burials, but the direction indicator was only mediocre in pointing the correct direction. Controls: The Evolution+ turns on when the harness is connected. The switch that changes between transmit ("SOS") and search is reasonably intuitive. A bump of the switch conveniently changes from search back to transmit. Comfort: As with the other ARVA Evo harnesses, you'll have to remove the harness from your body before you can perform a fine search. The Evolution+ transceiver is relatively large (47% larger than a Barryvox 3000, 18% larger than a Mammut Pulse, and 25% larger than a Pieps DSP Sport). Other: The English section of the owner's manual improved in 2007/2008, but it is still somewhat awkward. Pros: Very similar to the Tracker DTS. Cons: Can't resolve spikes. Bulky.